Holly: What the devil? Oh, pinning things on girls now. This one is met by silence. 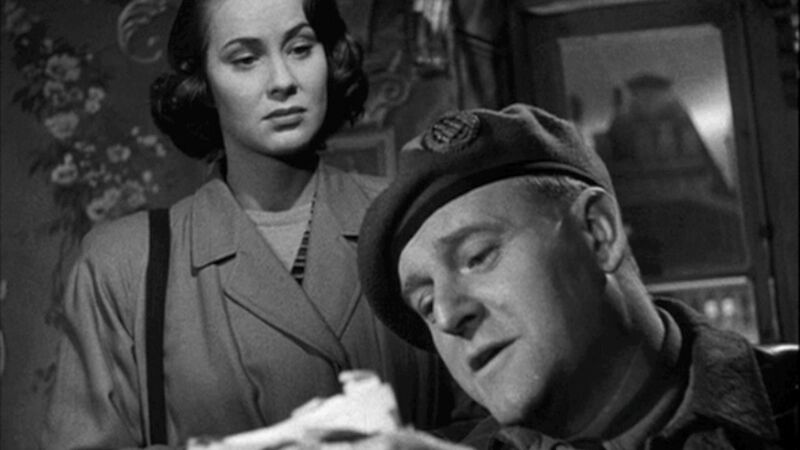 Major Calloway, the accused, simply goes on with his investigation, asking Anna to hand over her papers. Which prompts our next attack from Holly. Holly: Don’t give him anything. This time he is ignored, not just by Calloway but also by Anna, who begrudgingly hands her papers to the British Major. Holly, who must be hurt by this type of treatment, just stays on the offensive. Holly: How do you expect her to live in this city without papers? Once again, Holly is seemingly ignored by all parties involved. But that does little to slow down our boisterous hero. Holly: I suppose it wouldn’t interest you to know that Lime was murdered? You’re too busy. You haven’t even bothered to get complete evidence . . . And there was a third man there. I suppose that doesn’t sound peculiar to you. This one finally elicits a response from the major. Were this a boxing match, Holly’s quick jabs would have just been met with a solid punch in the jaw (like the one Holly received once already in this film), but since this is a banter-laden noir, Holly is dealt a deft comment to knock him down to size. Calloway: I’m not interested in whether a racketeer like Lime was killed by his friends or by accident. The only important thing is that he’s dead. This would paint her as a pitiable and love-lorn figure, one who some kind policeman could allow to slip through the cracks, but our frame above seems to tell the story a little differently. While her voice may be begging to be pitied, her face shows a stronger emotion. Anna is a professional actor, we may recall, but with Paine’s eyes trained on the paperwork in front of him, she has no need to hide the pure disgust in her face. Though she is seemingly taking the weaker route of assault, her odious glare tells us that it is not out of cowardice but out of cool, calculated design. Paine’s face seems to tell us the opposite. Though he has been “playing the game” for years, he does not know when he has been played, and he remains the cheery fellow he’s always been, even as Anna tries to manipulate him. Of course, neither of their tactics is particularly effective. Holly is easily rebuffed for his romantic nature and lack of experience, and Anna’s entreaties are swept away in the tide of bureaucracy. She is issued a receipt for the confiscated goods: her papers and the love letters from Harry. 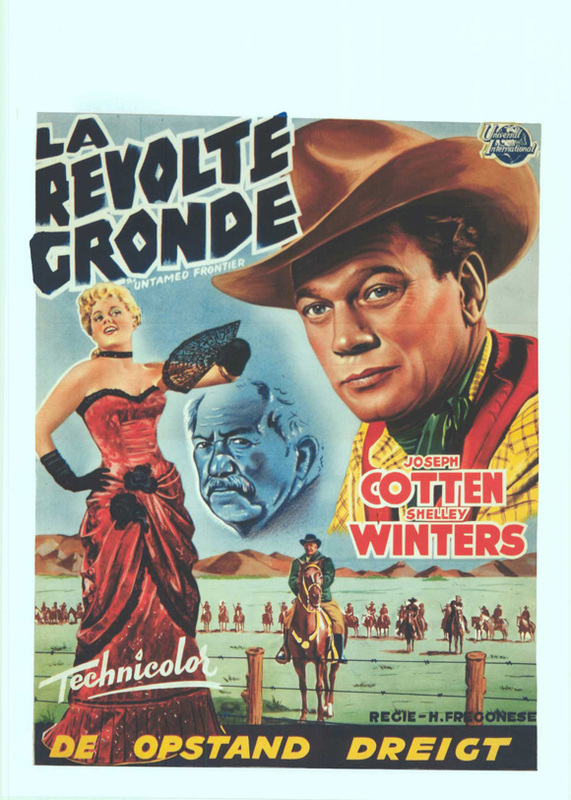 Joseph Cotten starred in "The Untamed Frontier" in 1952, three years after "The Third Man." Was he simply living out Holly Martins' fantasy? Her suspicious papers being confiscated is important to note, since it means that she is in danger of arrest or deportation, but also that she can become a tool in their investigation. Calloway and Paine are not particularly gung-ho about nailing Anna for fraudulent papers, but now that they have some dirt on her, they can leverage her to help nail Harry Lime for the racketeering charges they have in the works. She can also be more easily coerced into sharing information with them. At this point, she really doesn’t know much more than they do, but if she keeps following Holly down the rabbit hole this fingerhold will almost definitely come in handy. It is a smart move on the part of Calloway and Paine, and everyone involved seems to be aware of what it might mean down the road, except for happy-go-lucky Holly. It seems that everyone but Holly is living in the film-world of the Noir/Police Procedural, while Holly continues to gallop through his Western fantasies. This film, though produced by a British company, continues to straddle these two genres that are quintessentially American.